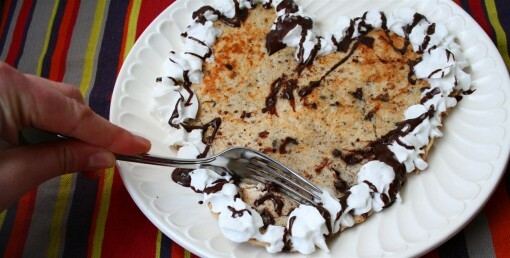 Heart Protein Pancakes was posted on February 11th, 2012 and is filed under Breakfast, Kid Friendly, Protein, Recipes. This entry has 16 comments. You can follow any responses through the RSS 2.0 Comment Feed. I promised you that in my next post I would share my newest protein pancake recipe. Honestly, when I tried it…it felt like I was having a warm, chocolate-chip cookie from the oven. With the addition of some whipped cream and chocolate sauce I felt like I was in heaven.What better way to start Valentine’s breakfast with? It’s great because it’s very filling, tastes like dessert, got some great fiber, and over 17 grams of protein! Bring it! Serves 1. I just ground some old-fashioned oats in the blender and then mixed all the ingredients together in a bowl. Spoon it out into a heart-shape on a heated, non-stick frying pan (spritzed with olive oil). To this. Give me that fork! I added some prettiness with the whipped cream and then drizzled some of this healthy chocolate sauce over top. 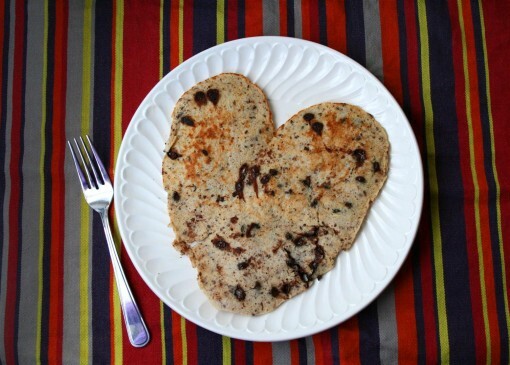 You can also do a bunch of mini hearts instead of one large pancake, which would be really cute. 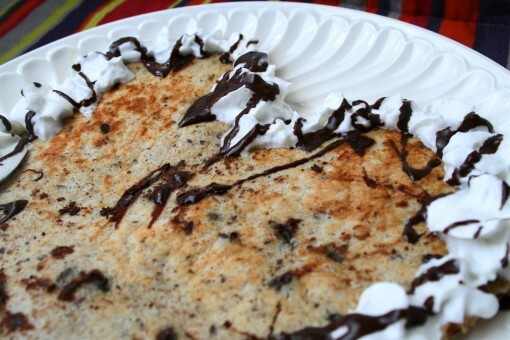 The best protein pancake I’ve had…so far. I’m always making new variations. I found this idea on SkinnyRunner…called “Six Things”, it’s just a little collection of fun questions that I thought would be fun to do! What’s your favourite drink? I am boring. I like water and chocolate almond milk. Would you consider yourself shy or outgoing? There’s very little that’s shy about me. I actually wish sometimes that I had a quieter personality. What’s your profession? Singer. Blogging and recipe-creating are secondary. How would you describe your style? Layers, lots of layers. I also love bright colours and wearing black. 5. If you could change one thing about yourself, what would it be? Run really fast…on second thought, I’d rather fly. What’s one makeup product you can’t live without? One? What’s impossible is that I’d choose just one. Would you consider yourself to be – shy or outgoing? What’s your favourite drink? I am definitely making these pancakes within the next day or so :) The recipe is actually similar to one I make, but you added flax! WHICH I LOVE!! Gorgeous! Nothing better than having warm chocolate chip cookie for breakfast :) I like to bake cookie dough oatmeal! So good. 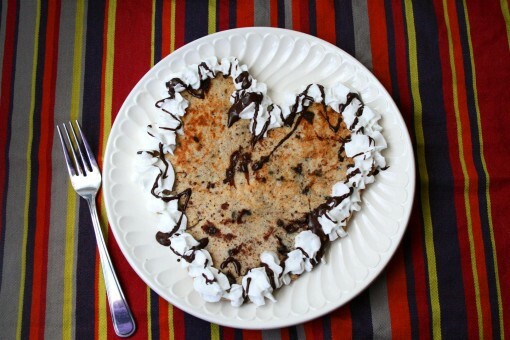 If my husband liked pancakes (or any breakfast pastry), I’d make these for him for Valentines Day. Cute! Those look so good, sweet yet filling! Sounds great. I am going to try this!!! Thank you!